My Key Machine is the perfect choice! To consistently develop the best customer-lead key cutting technologies in the World. With more than 150 combined years of key cutting experience, we have managed to design a truly wonderful machine that is set to revolutionise the industry for years to come. Our purpose built factory in Silsden allows us to keep a really close eye on the whole operation, making sure the people with the hard earned knowledge are the ones who continue to call the shots. We started building our first generation My Key Machine in the UK back in 2010. Given the sophistication of the technology involved, it took us 2 full years before our first machine was able to cut keys. Fast forward another 3 and we are able to build many My Key Machines each and every month, whilst still using 95% local suppliers. The appearance of the machine has evolved dramatically, but the revolutionary technology inside is still the bedrock in which our fantastic service is based. With hundreds of machines nationwide, you are only moments away from one of our unique My Key Machines. 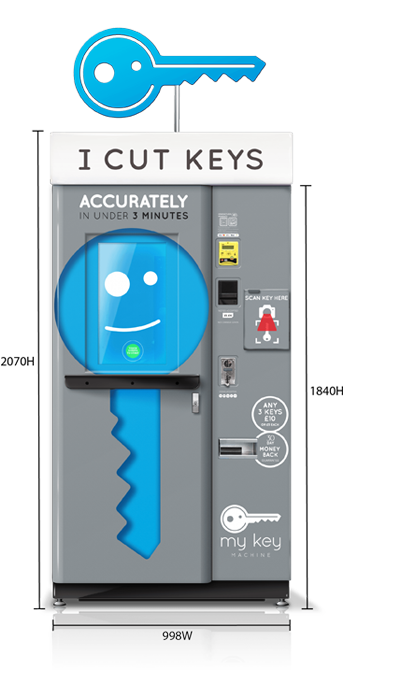 My Key Machine is a self-contained key cutting machine that uses state-of-the-art imaging technology to replicate keys quickly, efficiently, and accurately. It takes up less than 1 square metre of retail space, requires minimal staff training to operate, and can be delivered on-site to new retailers on a plug-and-play basis, remaining operational throughout store opening hours. Our professional service team maintain a national average breakdown rate per machine in excess of 300 days. All inventory management, service support and preventative maintenance come included with any My Key Machine. We understand more than most, that any trustworthy customer-facing service must be backed up by a brilliant support network. My Key Machine only requires a standard 13 AMP socket to be fully operational, without the usual Health and Safety risks that are associated with traditional key cutting. We offer the perfect key cutting solution for both employees and customers.